St. Louis Blues left wing Brenden Morrow (10) skates against Dallas Stars defenseman Aaron Rome (27) during the first period at the American Airlines Center. Yes, it was weird, odd and whatever adjective players use to describe their first time back in their former home arena with a new club. It was all of those things for former Dallas Stars captain Brenden Morrow, who made his first trip back to American Airlines Center with the St. Louis Blues on Sunday night. And the man who wore No. 10 for all those years in Big D admits that when a video tribute was shown on the video screen at the AAC during a break in play in the first period, it almost got to him. "I missed the first little bit. I didn’t know what was going on and then I caught some of it. 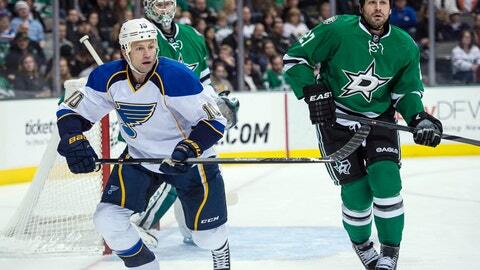 It’s pretty special," Morrow said after a 3-2 overtime win by the Blues. "Grew up with this team, happy to play one game and to get to play 800 or however many it was, however many years here and to see a collage of it up on the screen, it’s pretty emotional, feels pretty good." Morrow played some 835 regular-season games and 78 playoff games as a Star and served as the club’s captain from 2006 through 2013 before being traded to Pittsburgh last spring before the NHL Trade Deadline. He signed with the Blues during the offseason, which reunited him with former Stars head coach Ken Hitchcock and since St. Louis was on the tail end of a back-to-back on Sunday after beating Chicago in a shootout on Saturday night in the Gateway City, the experience of returning to Dallas for the first time was a bit different than it might have been under normal circumstances. "I don’t know if that was a good thing or a bad thing, coming in last night and not having a day to see people and sleep in your bed," Morrow said. "I’m not sure if that made it easier or harder, but we got through it." Morrow has been playing on the left side of St. Louis’ third line for most of the season, a trio he shares with former Dallas teammate Derek Roy, who was traded to Vancouver before last season’s deadline. And while he knows that changing teams is often a fact of life that accompanies playing in the National Hockey League, he always knew that his first game back in a place he called home for so long was going to be a unique experience. "It’s odd, just coming in here on a bus, not sleeping in your bed, walking to a different locker room," Morrow said. "Everything was a little bit strange and you’re used to being on the other side and the other end during warm-ups." However, he admitted that seeing his former team now sporting a new color scheme headlined by Victory Green made the experience a bit different. "The different colored jerseys maybe that helped a little bit. It’s a different green than I’m used to," he said. And it only makes sense to get his thoughts on the man who replaced him as captain, one Jamie Benn, someone who Morrow remains a big fan of. "Well, I’m his biggest fan. I loved him from day one, his attitude and the things he brings to the team," Morrow said. "I thought it was a no-brainer that he was the guy. I’m sure he’s going to do great things for this organization. He’s already well on his way."